When fighting game fans like myself tuned in to the PlayStation Experience in 2016, we were overjoyed as we got a pleasant surprise. This was the first time we got a glimpse of the then-upcoming latest entry to the Marvel vs. Capcom: Infinite. For a ton of people, this was a dream come true as no one really expected there to be another Marvel vs. Capcom game because of licensing issues and logistics. So the excitement over the trailer was palpable and fans really happy to see a new game enter the franchise. Fast-forward a year later and Marvel vs. Capcom: Infinite, while still getting some attention, is not the crowd pleaser Capcom was expecting. It used to be that fans would cry out “When’s Marvel?” (more accurately “When’s Mahvel?”) because they wanted to see some crazy, ball-busting fighting game action. They wanted to see Marvel and Capcom character duke it out with some fanciful air juggles, seizure inducing super attacks and super-high combo counts because it was so much damn fun to watch. But it looks like the hype train has left the station without Marvel vs. Capcom: Infinite. So, what happened? What happened to the game that was supposed to make our dream come true and instead became a forgettable dream? The problems all started when Capcom started giving us details on who was going to be part of Marvel vs. Capcom: Infinite’s roster. More specifically, who wasn’t going to be joining the game’s initial cast of characters. Fans noted that, although we were going to get fan favorites like X/Megaman, Jedah and Strider for the Capcom side, there were huge omissions on the Marvel side of things: none of the X-Men were there! This meant long-running mainstays like Wolverine, Magneto and Storm weren’t returning. This really turned off a lot of fans as X-Men practically launched the Vs. style of gameplay with the X-Men: Children of the Atom arcade fighting game. Fans who have used these characters in previous Marvel vs. Capcom game immediately felt alienated by their exclusions. Most people figured out that the reason why the X-Men were kept out of the roster was because of the entire Marvel Cinematic Universe. It looked like Marvel/Disney only approved the characters that were featured in their movies. The X-Men films, on the other hard, then belonged to Fox and it looked like Marvel/Disney didn’t want their movies to get any kind of side promotion by putting them in the game. This was already a bitter pill to swallow for longtime fans who mained these characters. But the explanation why they weren’t included made fans irate. When asked about why the game didn’t have any X-Men characters, Capcom Community Manager Peter “Combofiend” Rosas said that the characters are just “functions.” You didn’t need mainstay Magneto for his eight-way dash and speed since you now have characters like Ultron and Captain Marvel that can do the same thing. This set a lot of fans off on him. While he is technically correct, this doesn’t take into account the attachments we have with these fictional characters. It’s why geeks get so upset at the Michael Bay Transformers movies because they don’t follow the animated series. It’s why we didn’t like Galactus just being a giant cloud of little machines in Fantastic Four: Rise of the Silver Surfer. Now, I don’t envy Combofiend for having to answer a loaded question and I don’t think anything he said would’ve sounded acceptable. But his answer just didn’t sit well with fans, leading to a lot of negative press and feeling for the game even before it came out. It certainly didn’t help that Marvel vs. Capcom: Infinite looks rather drab and even downright ugly at times. The biggest offender has to be Chun-Li’s face. When the first story mode trailer was released, people didn’t talk about Gamora being in the game or how Thanos would factor in the overarching story, things that fans would usually talk and speculate about. No, they were talking about something else: Chun-Li’s face. It’s… what the heck, Capcom? 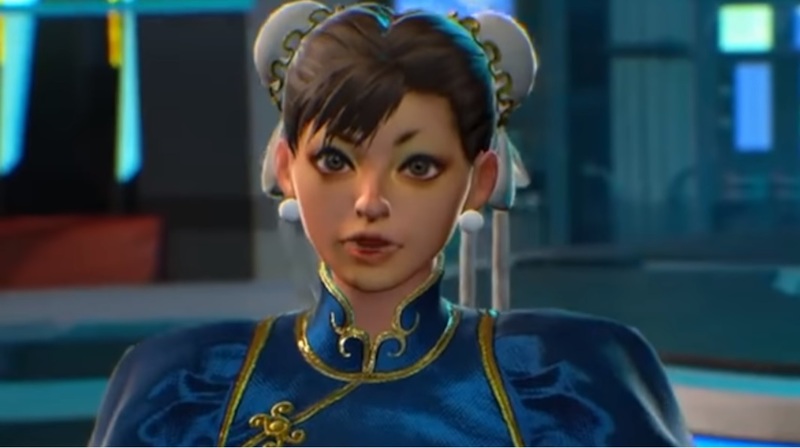 Chun-Li’s face in the first Story Mode trailer was horrific as there was something about it that was off-putting to look at. If I were to describe it, her face looked someone got a Kewpie doll’s head, ripped off its face and plastered it on hers. While Capcom did made some adjustments to her face to make her look less monstrous, her initial head model was a symptom of the game’s poor graphics. Marvel vs. Capcom: Infinite, despite being the latest game in the series, looks bad when compared to its earlier entries. However, I can’t really say that the graphics are bad. It just looks average in my opinion. The biggest issue is the art style. It’s like Capcom determined that the best course of action was to make it look like a serious CGI film rather than making them look like fun animated/comic book characters. As a result, the color palette looks muted instead of bright and flashy. The backgrounds are lifeless and barren of any personality instead of brimming with nods and winks to both Marvel and Capcom fans. Even the attacks and effects looked incredibly subdued instead of being overly exaggerated beams of light or explosions. Infinite just didn’t look all that great when compared to previous entries. Another point-of-contention fans have with the game was the seeming regression to 2-character teams as well as some mechanic changes. Now, changing the mechanics in a fighting game, even within the same series isn’t anything new. Capcom’s done it before with their games. Fans, however, felt that they were dumbing things way down with Infinite. Not only did they change the team sizes back to 2, they also removed the assist functions. This led to the game looking more controlled instead of the usual chaos the series had when they moved to the 3-person teams. But the chaotic and frantic action was one of the reasons why Marvel vs. Capcom games became so popular in the first place. The addition of the Infinity Stones was supposed to take the place of the assists and help make the action more fast paced. You can debate how successful Capcom was with its implementation but you can’t debate that the action in Infinite looks so much tamer than when the game was a 3-vs-3 affair. Infinite’s mechanics are solid if you take them by themselves but just feel lackluster when compared to the other games in the franchise’s 20 year history. In this sense, you can even say that earlier entries made Infinite look lame. But there was one game on the horizon that metaphorically pulled the rug from under Infinite: Dragon Ball FighterZ. Strangely enough, a lot of the reasons why Dragon Ball FighterZ stole most of Infinite’s hype was because it copied most of the latter. Think about it. Dragon Ball FighterZ has a bunch of incredibly popular licensed characters as part of its roster, with graphics that looks like it was pulled directly from a cartoon. The game allows for outrageous 3-vs-3 combat. You can launch combatants in the air and juggle them with a long string of combos. You can call in assists and annihilate your opponent with flashy and insane looking super attacks. When fans saw Dragon Ball FighterZ, they immediately thought that this is what Marvel vs. Capcom: Infinite should’ve been. With a year filled with so many awesome fighting games, Marvel vs. Capcom: Infinite failed to stand out. It’s really sad to even be thinking that because the series used to be the one that was enjoyable to play and even watch. It’s still possible for Capcom to make some adjustments. They can add a graphics filter to make the colors and the characters pop out a little more. They can adjust the supers to look more flashy. They can even add the X-Men as DLC characters as well, which would appease most fans of the series. But they’re still going to have to work within the basic confines of the game engine so it’s going to be impossible to tweak it to allow for things like assists and 3-person teams in the future. My take on Marvel vs. Capcom: Infinite is that it’s an okay fighting game. The new game mechanics do take some getting used to but is workable even for newbie to wrap their heads around. It’s still a fun game but you do have to overlook the very plain looking graphics and somewhat ugly art style. All of that comes out to a very average fighting game instead of the flashy game it should be. That’s the biggest issue with Marvel vs. Capcom: Infinite. It doesn’t live up to its legacy of insanity and craziness the series is known for. It just feels average and, for a Marvel vs. Capcom game, that’s a disappointment. With that being said, I do still like the game as a whole and I do hope that Capcom and Marvel/Disney doesn’t let the game’s seemingly poor sales deter them from making another Marvel vs. Capcom game. I was hyped when they announced Infinite and I’ll be hyped again when they announce a new Marvel vs. Capcom game in the future. What’s your take on Marvel vs. Capcom: Infinite: Let me know in the comments section below! Man, this isn’t even going into the DLC practices. The game started advertising DLC charcters before it even revealed the whole base roster. Characters that really should have been in the base game, like Sigma, Black Panther and Monster Hunter where gated off through a paywall. Yet another hype killer.